It’s hard to put this children’s book in any category. Let me start with a disclaimer… it’s part of a new series presented by Rick Riordan, beloved by every middle-school boy for the Percy Jackson Greek myth series, and I never reviewed those because they all felt too grim. This series is based on Hindu mythology, and in many ways, it’s just the opposite…it’s almost too silly. But… it works. 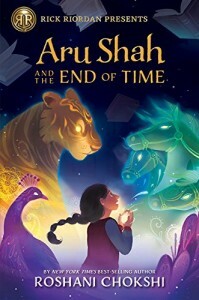 Think of Bollywood movie meets contemporary teenagers who meet Indian epics, and you can see that the children’s book will be all over the map. I’ve got a fairly good knowledge of the Indian epics, so for me, much was familiar, and interesting. It’s hard to say how it will be received by children who have no connection to those myths. Yet, even without knowing the characters, the story is a good escapist fantasy. The two heroines must journey to the “other worlds” to save this one. The plot isn’t that complicated, but the stories within the stories make it a complex. Yet throughout the whole book, there is so much lighthearted humor, that it’s never really heavy. Even visits to the Kingdom of Death, and the concepts of reincarnation and karma, are handled with terrific humor and clarity, as in the sign they encounter, “Remake, Rebuild, Relive: Reincarnation Manufacturing Services.” Most of the humor made me groan and laugh outloud simultaneously. At the same time, there is a profound message running through this entire children’s book. We all have the capacity to be heroes and heroines, given the opportunity. We just need to be able to see our so-called faults from another perspective, and see them as our gifts, when used for others. For that message alone, this children’s book is worth scrolling through.